Spring break once was a monumental rie of passage for thousands of college students flocking south for a week of warm weather in March and April. Today, however, spring break (aka spring recess, spring vacation, semester break) has greatly expanded to include older and younger spring breakers, families and couples heading south and much further afield. From Florida, Texas, and Arizona, to urban spring breaks like New York City, Washington, D.C., and even across the Atlantic to Europe and beyond, spring break is more popular than ever. Of course, the Sunshine State continues to be a spring break hot spot. Panama City Beach in the Panhandle continues to provide a classic spring break experience to all ages. With 27 miles of sparkling white sand beaches and timeless attractions from the '60s, Panama City Beach provides a throwback spring break destination for all ages. Heading down the east coast, Daytona Beach (auto racing heritage and driving on the beach), Ft. Lauderdale (with expanded Sawgrass Mills shopping), and Miami and Miami Beach (the classic beach starts its centennial celebration in late-March) all provide varied spring break options. 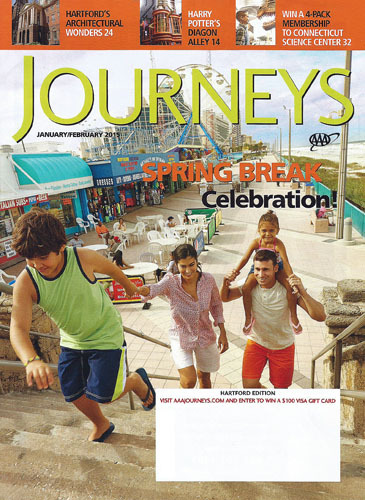 Sun and sand, fresh seafood, lots of events, shopping and spas keep drawing spring breakers year after year. Those heading to the middle Florida Keys now can enjoy an immersive experience with reef fish, invertebrates, stingrays, and even sharks--without entering the ocean--at Florida Keys Aquarium Encounters, a marine life attraction that opened recently in Marathon. The Orlando area remains a popular spring break destination. Springtime possibilities include: the 75-day Epcot International Flower & Garden Festival (March 4-May 17, 2015) at Walt Disney World Resort; the all-new daytime Disney Festival of Fantasy Parade; and The Wizarding World of Harry Potter--Dragon Alley at Universal Orlando Resort. Orlando also offers a central Florida base for exploring the state's many popular Major League Baseball spring training options. From fields of wildflowers to the warm Gulf Coast breeze, the Lone Star State also has something for everyone. South Padre Island is the state's most popular beach and typically welcomes thousands of spring breakers. Elsewhere, spring breakers can enjoy tubing on the cool Guadalupe River in New Braunfels, world-renowned bird watching, the legendary music scene and more in hip Austin, and San Antonio's bustling Riverwalk--still the state's top tourist attractions. Arizona remains a popular spring destination, thanks to the warm desert sun, the Grand Canyon, the Phoenix area's big city options and much more. Spring training games at Arizona's new and vintage baseball stadiums are also popular choices for fans of America's pastime. In Nevada, Las Vegas and the rest of the Silver State always provides something new. In Vegas, the High Roller is a new 550-foot-tall Ferris wheel that opened in 2014 to rave reviews. It's located just off the famed Strip in the bustling LINQ outdoor shopping, entertainment, and dining district. Further afield, northern Nevada's Lake Tahoe region is particularly popular come March and beyond, thanks to world-renowned spring skiing. With more than 50 million annual visitors, New York City provides many springtime attractions including cultural attractions, plays, events, dining, and more--like the new 9/11 Memorial Museum in Lower Manhattan and the new ScuptureCenter in Queens. The three-week citywide Cherry Blossom Festival in Washington, D.C., celebrates the 1912 gift of 3,000 cherry trees to Washington, D.C., by the mayor of Tokyo. National parks are a great choice in the springtime, where summer crowds and heat haven't yet arrived. Some great options include: Yellowstone National Park (where bear cubs emerge from their dens in late-March); Grand Canyon National Park (where hiking is perfect in the spring); Death Valley National Park (just 2 ½ hours from Las Vegas); New River Gorge National River in West Virginia (featuring world-class whitewater rafting starting in the spring); and Florida's Everglades National Park (where lots of wildlife and warm weather await). The Caribbean, Mexico, and Central America also have grown in popularity with those in search of warm weather. All-inclusives and other resorts on Caribbean islands and the Mexican coast (especially Cancun) provide warm weather havens, while Central America options like Costa Rica, Panama, Belize, and other possibilities are great for nature lovers. In addition, Caribbean cruises continue to offer a value-packed multiple-destination spring break option with various cruise lines. Across the Atlantic, even Europe draws varied visitors on spring break. Europe especially is popular with families and couples in search of history, culture, and bonding times without the summer crowds. Of course, the Mediterranean remains popular in the spring, thanks to warm coastal hotspots in France, Italy, Spain, Portugal, and beyond, plus varied Mediterranean cruises. *South Padre Island welcomes more than 18,000 spring breakers each March and April. *There are more than 500 spring training games to catch in Florida and Arizona each spring.